Indian market is flooded with sunscreens for men and women. Even though people cannot stop talking about how crucial sunscreen is, if your use of sunscreen leads to more acne, then it is not a fair deal, is it? If you are battling severe acne, it is advisable to first get the acne somewhat under control through medication and skin care before looking for a sunscreen. There are tons of oil-free sunscreens in the Indian market claiming to provide protection from sunburn and tanning. When it comes to sunscreen, it does not help to settle for the cheapest one. 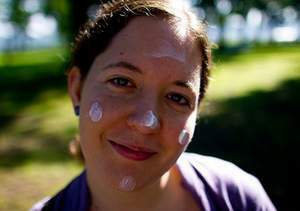 Herbal sunscreens are not necessarily better for oily / acne prone skin. How much SPF is needed for Indian weather and summers? Although there is a lot of emphasis given to the SPF number, it is best not to get too hung up about this number. After a point (say SPF 30), any SPF is good enough. An increase in SPF from say 40 to 50 provides only a tiny bit more protection. For Indian summers, an SPF of 30-40 is good. How to properly use sunscreen? Take a big pea size amount of sunscreen and apply liberally to cover the face and neck. If the face looks white immediately after, wait for the sunscreen to sink into the skin instead of rubbing it in vigorously. Apply sunscreen about 15 minutes before sun exposure so that all of it can absorb into the skin. Reapply every 2-3 hours if you are outdoors or sweating. What is a good sunscreen for acne prone skin? Avoid water-proof, sweat-proof sunscreens. Gel formulas usually work well. Physical sunscreens that contain zinc oxide are the best, but they can leave a white cast on brown skin. We have compiled a list of the best sunscreens available in the Indian market that are suitable for oily acne prone skin. The daily use sunscreens listed here can be used by men as well as women. Even though the list has been carefully compiled keeping in mind the needs of oily acne prone skin, you should do a patch test on part of your face before using any of the sunscreens on the whole face.The list is in no particular order. Also see our recommendations for the best oily skin moisturizer without SPF. A “water based sunscreen” suitable for oily acne prone skin. Sunscote gel by Curatio is an oil-free sunscreen gel for face and body. It is a light weight sunscreen formula that does a good job of preventing sunburn and tanning. This gel based sunscreen spreads easily leaving a non-sticky feel on the skin. If your skin tends to get dry over the course of the day, you will need to use a separate moisturizer with this sunscreen. Since this is a chemical sunscreen, it should be the first thing you apply on your skin after washing and let it sit for 15 minutes. Then go ahead with your moisturizer and makeup on top of it. Since Suncote is gel based (though not a transparent gel), you can avoid the whitecast that physical sunblocks can leave behind. Suncote is very safe for skin that breaks out into pimples easily. But it isn’t the best choice if your skin is quite oily. It doesn’t give a matte finish and depending on the skin’s oiliness and the weather, it can cause a shiny look on the face. It is best suited for normal to dry acne prone skin. The price of Suncote gel is Rs. 249 for 100 gm. 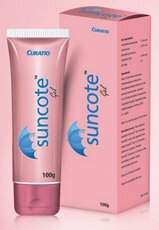 If your skin breaks out very easily, Suncote Gel is a safe choice. Kaya Skin Clinic Daily Use Sunscreen is a light weight sunscreen that spreads easily without leaving a sticky feel. It claims to provide high protection against UVA and UVB rays. Even though the SPF of 15 seems inadequate for Indian summers, this could be a good choice for those who mostly stay indoors. This daily use sunscreen is moisturizing, but not so much as to make your skin overly oily. It doesn’t leave a white film on the face. This is a safe sunscreen for those whose skin breaks out easily. This version with SPF 15 is more suited to oily skin whereas the Daily Use Sunscreen with SPF 30 is suited for normal to very dry skin types. The SPF 15 version is non-comedogenic, but the SPF 30 one isn’t. The price of Kaya Skin Clinic Daily Use Sunscreen is Rs. 790 for 50 ml. Proctiv, popular for their 3 step acne control kit is now available in India. Proactiv Daily Protection lotion with SPF 30 is an oil-free, non-comedogenic sunscreen designed specifically for oily acne prone skin. Proactiv sunscreen absorbs quickly without leaving an oil film or a white cast. This is a broad spectrum sunscreen. The price of Proactiv Sunscreen lotion is Rs. 799 for 112 gm. It is available from proactiv.in and healthkart.com. Sebamed Sun Care 50+ Sun Lotion is meant for very sensitive and sun intolerant skin. This sunscreen is water and sweat resistant for up to 6 hours, oil-free, free from paraffin, parabens, PEG bonds and PABA esters and acrylamide. It is suitable for both children and adults. It is also available in a spray formula with pretty much the same ingredients. If you are looking for a waterproof sunscreen for acne prone skin, this is as good as it gets. Sebamed sunscreen does not mattify well and you might need to powder your face after applying it, but given all the other requirements, this works out to be a suitable choice. A problem commonly reported with this sunscreen is a white cast on brown skin. That is due to its high titanium dioxide content. One way to reduce a white cast is to opt for a lower SPF since Sebamed is available in a multitude of SPF values. The price of Sebamed Sun Care 50+ Very High Multi Protect Sun Lotion pH 5.5 is Rs. 1500 for 150 ml. Aqua, Dibutyl Adipate, Octocrylene, Titanium Dioxide, C12-15 Alkyl Benzoate, Butyl Methoxydibenzoylmethane, Diethylamino Hydroxybenzoyl Hexyl Benzoate, Glycerin, Dimethicone, PVP/Eicosene Copolymer, Panthenol, Microcrystalline Cellulose, Tocopheryl Acetate, Bis-Ethylhexyloxyphenol Methoxyphenyl Triazine, Diethylhexyl Butamido Triazone, Ethylhexylglycerin, Sodium Cetearyl Sulfate, Silica, Benzyl Alcohol, Cellulose Gum, Parfum, Glyceryl Stearate, Cetearyl Alcohol, Cetyl Palmitate, Cocoglycerides, Xanthan Gum, Sorbic Acid, Disodium EDTA, Lauryl Glucoside, Polyglyceryl-2 Dipolyhydroxystearate, Phenoxyethanol, Inulin, Dehydroacetic Acid, Lecithin. While this post lists some of the best sunscreens, it isn’t updated with every new sunscreen we discover. For latest sunscreen options, check our sunscreen reviews. Suncros gel comes out as a white creamy sunscreen but blends into a gel like texture. It has both UVA and UVB filtering ingredients. Suncros has nanonized (which means really really fine) zinc oxide which not only holds well against the sun but also minimizes any white cast that zinc oxide based sunscreens can cause. The price of Suncros gel is Rs. 280 for 100 gm. If your skin breaks out very easily, Suncros is not a safe choice. Among cosmetic brands, Lotus Herbals has a variety of sunscreens to offer for oily acne prone skin. The gel formula of UV Screen Matte Gel promises to be ultra calming to the skin, giving it a matte, oil-free look. But does it work as a sunscreen? The PA+++ and SPF ratings on the label would have you think so. PA+++ provides a high protection from UVA sun rays that cause tanning and wrinkles. An SPF 50 is very high protection against UVB rays that can cause sunburn and skin cancer. In that way, the Matte Gel covers all bases, making it a broad spectrum sunscreen. Even though Lotus Herbals UV Screen Matte Gel does not claim to be non-comedogenic, it has been known to not cause pimples. It does not leave a white cast. Do not expect all herbal ingredients with this though, because the ingredient list names a ton of un-pronounceable compounds. This sunscreen does not claim to be oil-free or non-comedogenic, but has been generally reported to be suitable for oily acne prone skin. Being a translucent gel formula, it does not leave a white cast on the face. The price of Lotus Herbals UV Screen Matte Gel is Rs. 225 for 50 gm. If your skin breaks out very easily, Lotus UVScreen is not a safe choice. Lotus Herbals 3-in-1 Matte Look Daily Sun Block is one of the most popular Indian sunscreens for oily skin. The 3-in-1 action of this sunscreen is because of sun protection, skin lightening (tan removal) and mattifying. It has been known to keep skin looking matte (oil-free) for hours while preventing tanning. The SPF of 40 is high protection against UVB rays and the PA+++ against UVA rays. If most sunscreens leave your face looking shiny or oily, this matte formula could work for you. You have to note that this is a tinted sunscreen that evens out the skin like a light foundation. So if you are not comfortable with any kind of tint on your face, you can leave this out. The price of Lotus Herbals 3-in-1 Matte Look Sun Block is Rs. 325 for 100 gm. If your skin breaks out very easily, Lotus 3-in-1 Matte is not a safe choice. Melascreen sunscreen lotion is a liquidy, white sunscreen lotion available at medical stores. If most sunscreens cause pimples on your face, Melascreen can be a good choice. The main reason being a high percentage of zinc oxide. Zinc oxide is not only a good physical sunblock ingredient, but also great for oily acne prone skin in general. Containing both UVA and UVB filtering ingredients, Melascreen is a full-spectrum sunscreen. The downside of this sunscreen is that it could leave a white film (whitecast) on your skin due to titanium oxide and zinc oxide. If sunscreens cause your face to become oily, Melascreen can guard against that, thanks to its zinc oxide content. Whether it is an oil-free sunscreen or not is not clear since the ingredients of the lotion base used for this sunscreen are not given on the label. This sunscreen is a mix of chemical and physical sunscreen ingredients. Melascreen sunscreen lotion covered here is one by Mark (India) Cosmed and not the DuCray one. The price of Melascreen sunscreen lotion is Rs. 75 for 50 ml. Living Proof has some good skin care products for oily acne prone skin, the Multi-Protection Day Cream SPF 50 being one of them. This heavy duty sunscreen plus moisturizer is free from 8 allergy causing ingredients including artificial coloring, perfumes, alcohol, mineral oil, lanolin and comedogenic (pore clogging, acne causing) ingredients. This sunscreen is a good choice for you if you have acne prone skin that tends towards dry. For oily skins, this could make skin shiny. The price of Living Proof Multi-Protection Day Cream is Rs. 645 for 40 ml. Living Proof products are available online from flipkart.com and other shopping websites. Eau Thermale Avene SPF 50+ is very water resistant, paraben-free, hypo allergenic and non-comedogenic. Avene sunscreen is actually a sun cream that does not leave much of a white cast. It does not increase oiliness either. It is designed for normal to combination sensitive skin. This Nivea for Men whitening plus sunscreen is laced with 10 nutrients including Whitanat that is proven by skin care scientists to whiten dull, damaged skin 10 times better than vitamin C.
It protects skin from re-darkening with SPF 30. The non-sticky and ultra-light texture has been specifically developed for men’s skin. It absorbs quicker and leaves no residue. Nivea for Men Advanced Whitening Dark Spot Reduction Moisturiser SPF 30 is safe for acne prone skin that does not break out easily. The price is Rs. 95 for 15 ml. Read more about its ingredients and reviews here. Which is your favourite sunscreen for oily skin?